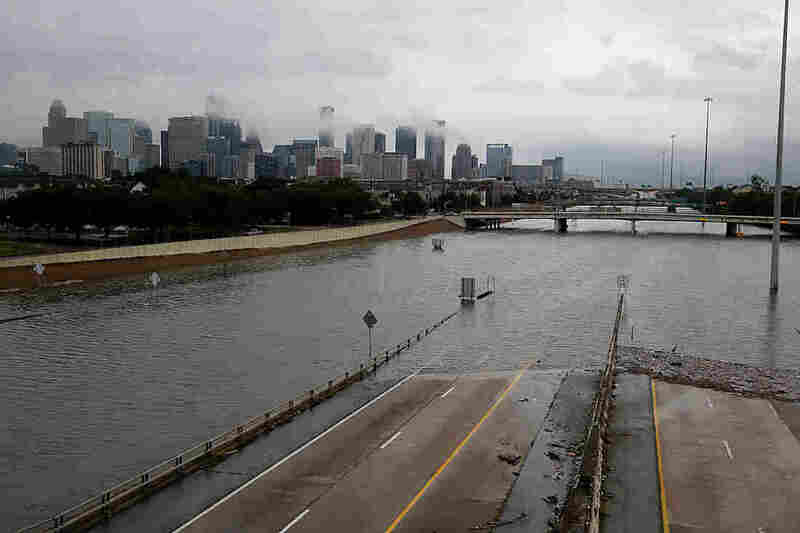 Houston Airports And Ports Begin Opening As the heavy rains have let up in Houston, officials are assessing when they can reopen the city's port and airports. Both airports opened with limited service Wednesday. The port will take longer. Planes are parked at George Bush Intercontinental Airport in Houston on Tuesday. The airport, which had been closed since Hurricane Harvey made landfall, opened with limited service on Wednesday. "Yesterday, we flew the last of the remaining customers who were at Houston out of the airport and into our other hubs," says Charlie Hobart, United Airlines spokesman. "So right now, it's about preparing for the eventual resumption of service." 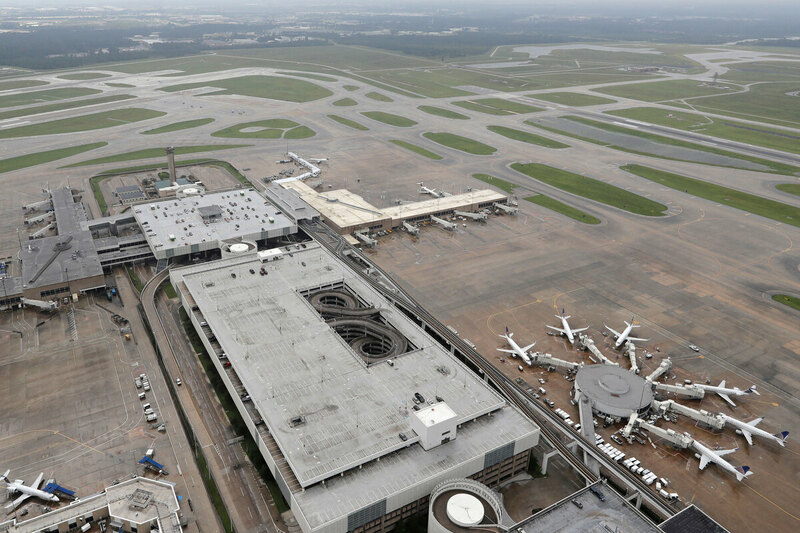 The Houston Airport System announced it was reopening both George Bush Intercontinental and William P. Hobby at 4 p.m. Wednesday. Passengers are being told to check with their airlines on the status of their flights. The cost of shutting down these airports for several days is substantial. Because Houston is a hub, the shutdown may cost United at least $265 million, according to a report by Cowen & Co. analyst Helane Becker. Southwest, with a heavy schedule at the William P. Hobby Airport, stands to lose some $77 million for the quarter. But with many roads still impassable, shippers like FedEx and UPS can't say when they'll resume service in Houston. UPS spokesman Jim Mayer says there's no point in flying packages into Houston if the company can't deliver them to customers. "We have to be able to get our vehicles out. We have to have people to drive the vehicles, load the vehicles," Mayer says. "So, it's really a tough situation in Houston. We're making plans to get back into operation as soon as we can safely do so." The downtown Houston skyline and flooded Highway 288 are shown on Sunday. The BNSF Railway and Union Pacific Railroad also have suspended service along the Texas coast. BNSF says it's dealing with multiple track washouts. Intermodal centers, where goods are transferred from rail cars to trucks, are also shut down because so many roads are impassable. The shutdown of Houston's air, rail and port operations, plus the closure of key roads, is likely to have more than just a regional impact. Noel Perry, a logistics consultant with FTR Transportation Intelligence says, "Houston is an interchange point. It isn't the only one, but it's an important one. So there are effects that go east and west and north." Perry points to similar disruptions after hurricanes Katrina and Sandy, and the 2014 snowstorms that shut down much of the Northeast. When trucking resumed, he says the cost of freight deliveries spiked. "I would expect something like that again here," Perry says. "If you're trying to get a dry van (trailer) to run into Houston or out of Houston, at some point over the next couple of weeks, you're going to be paying a hell of a lot more." Perry expects the disruption from Harvey will cause a smaller but still significant increase in freight costs nationally as well. As Houston begins its recovery and looks toward the future, one dire question remains: how long before Port Houston — a 25-mile-long complex of public and private facilities — can reopen. "There's 40 or 50 vessels in and out of here every single day," says Roger Guenther, Port Houston's executive director. "And this is not only the container ships and the general cargo ships, but things like the oil tankers." Nearly two-thirds of the nation's traffic in petrochemicals flows through the port, and a lengthy port shutdown would have an impact on fuel prices. Guenther says a task force headed by the Coast Guard is just beginning to assess the condition of the port, post-Harvey, and determine what needs to be done before it reopens. But initial reports are positive. "Our container facilities, our general cargo facilities received minimal damage," Guenther says. "You know there weren't the high winds like we saw in (Hurricane) Ike. It's all about the tremendous amount of water that's being dumped into the channel." Houston's shipping channel will have to be surveyed for debris and other navigation hazards before it's cleared to reopen. How long that will take is uncertain, but after Ike, it took one week for the port to resume operations.